BLACKSBURG, Va. -- A former Virginia news anchor whose girlfriend was fatally shot during a live broadcast in 2015 says he plans to run for a seat in the House of Delegates. Chris Hurst tells The Roanoke Times that he will seek the Democratic nomination for the 12th House District seat. The seat is currently held by Republican Del. Joseph Yost, who says he will run for re-election. 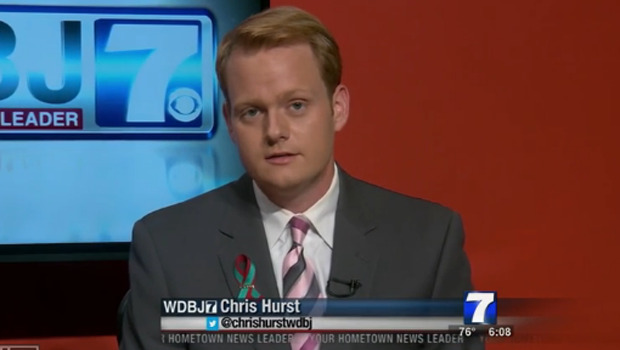 Hurst left CBS affiliate WDBJ on Friday, after six and a half years the station, WDBJ reports.. He was dating reporter Alison Parker in August 2015 when she was fatally shot while conducting an interview on live TV. WDBJ cameraman Adam Ward was also killed. The gunman, Vester Lee Flanagan, a former employee of the station, fatally shot himself five hours later after a police chase. Hurst has never held public office. He says that while reducing gun violence will be a big part of his campaign, he is also interested in many other issues.